Jennifer and I leave Mudgee and head down to Sydney where on Thursday we fly out to Bombay. There we begin work on my intuition film. From Bombay we head to Delhi, then up to the holy town of Rishikesh on the Ganges. And downstream to the major pilgrimage city of Haridwar. Then we head north to Amristar in Punjab, and the famed Golden Temple. From there we then head up into the base of the Himalayas, to the Dalai Lama’s residence-in-exile at Dharamsala. We then fly to Rome, to seek the Church’s views on intuition. While in Italy we’ll also do a scout of the Assisi tour, which we’re mounting next year. I’m very excited to be finally shooting this film, which has been gestating now for fifteen years, ever since an intuitive “voice” saved my life very early one morning in New Orleans. Thank you to those who’ve come on board as investors to help me realise this amazing film. And to those who might be interested in supporting this project, please let me know and I’ll send you some information. I approach any new film with a degree of trepidation. I know what a huge undertaking it is, and what a huge responsibility. But it’s also an incredible privilege – because I’m in the fortunate position where I can disseminate ideas to a world audience. It’s taken me nearly forty years of honing my craft to have this privilege, and consequently I want each film I now make to matter. I believe this next film will matter. I’ll be blogging daily and posting photos – so stay tuned here for regular updates. Whenever I travel, I always carry a St. Christopher’s medallion with me. 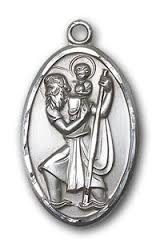 St. Christopher is the patron saint of travellers. I do this because in 1982 I made a film about a lone sailor whose yacht sank in a storm in the middle of the Pacific. The sailor was a remarkable man, aged 70, and he survived for 32 days adrift in a life raft. He put his survival down to a St Christopher medal he had with him. Ever since making that film – my second independent film, and one that I’m particularly proud of – I’ve carried a medallion with me in my wallet whenever I travel. I got it from the Notre Dame Cathedral in Paris. I also have one on my car key ring. I’m not Catholic, and I’m not religious, but still these medallions are important to me. I’d feel very uncomfortable traveling without one. 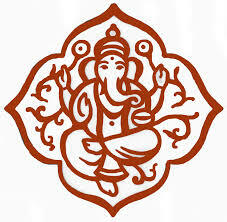 And on this journey I’ll also carry a little Ganesha with me – the Hindu Elephant God that clears away all obstacles. ok guys, so now we have the comments box back. Every best wish for your time in India and Italy. I hope that every moment will be a joy for you both. ‘Looking forward to sharing the many wonderful experiences you’ll have via the blog. Have a great and prosperous trip. It will be exciting. Those of you who believe in this film and have not yet invested better jump on board. I believe it is a great investment, and a great joint venture. Thank you Steve and Jill. You two kicked this off with your faith and support. Literally just a few minutes ago I got email confirmation of another investor who’s come on board. Putting funds in immediately. That’s very sweet of you to say Steve, thank you – but each person on this blog has been supporting me all along, just by being here and being a part of this very special group of amazing people.